Hasselblad has unveiled a long awaited upgrade to its H System medium format cameras. 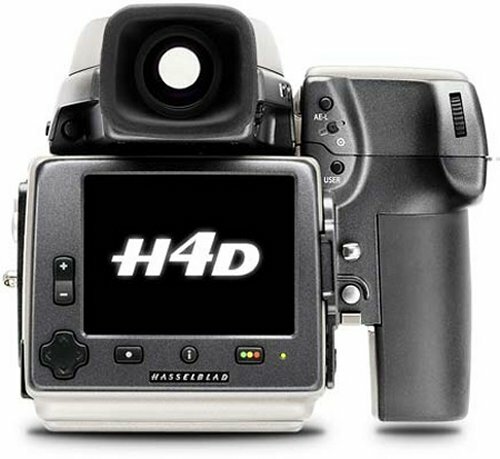 The H4D is touted as being one of the first cameras to feature a true off-center autofocus system, known as True Focus. Even DSLRs often have to focus first and then reposition the camera to get focus away from the center, but the H4D has a yaw rate sensor that detects the horizontal and vertical movement away from the focus point and refocuses the lens to compensate for it. The camera features automatic adjustment for color, vignetting and other image qualities and can be connected to a computer over FireWire to bypass the camera’s storage. The company’s own Phocus software has also been updated to be faster and easier to use. If you have always wanted to add some cameras around you home to see who was at the front door or keep an eye on your kids no matter what room they are in, two things probably held you back. One is how hard most video systems are to install and the other is how expensive the systems are. Avaak has announced that the Vue Personal Video network is now shipping. 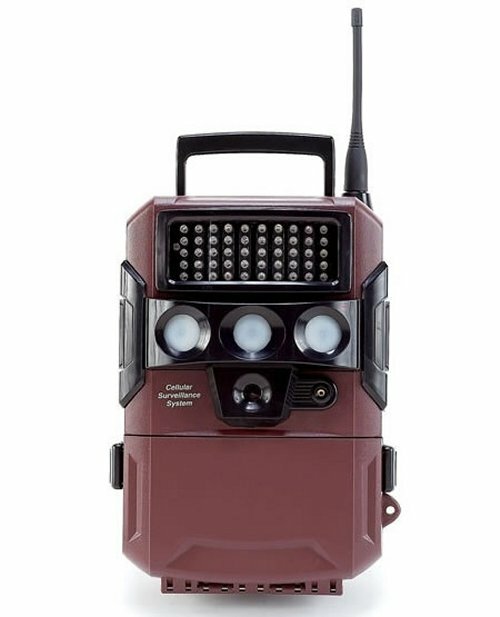 The system is a kit that ships with a wireless video portal device and two battery-powered wireless cameras. The cameras have cool and easy mounts that are self adhesive and magnetic. Solar Technology’s CamCaddy universal camera charger is already available in a bundle with the company’s Freeloader Pro solar charger, but now it’s available by itself. 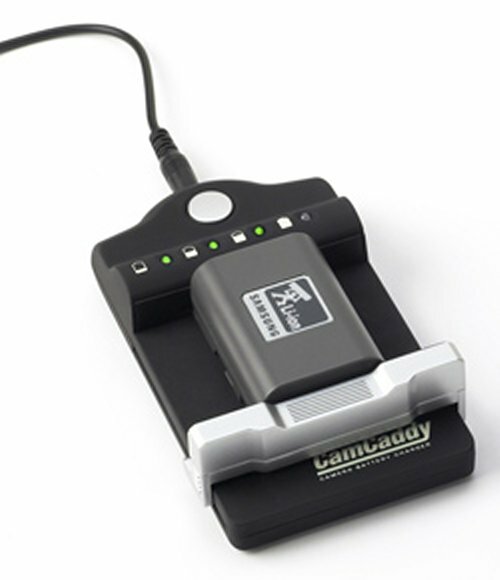 The charger isn’t 100% “universal”, but the company says it should be compatible with over 85% of the proprietary batteries used in digital cameras, camcorders and DSLRs, and if you are unsure, just check their website before you buy. The charger is also of course still fully compatible with the Freeloader and Freeloader Pro, and it comes with a car adapter, a USB charging cable, and US and Euro plug adapters so you should be covered. Sony has unveiled the full-frame A850 DSLR along with some friends, like the mid-range A550 and A500 DSLRs. 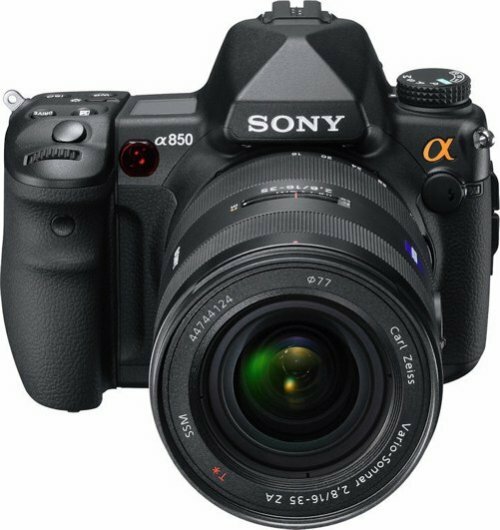 The A850 is basically a toned down A900 that keeps the 24.6-megapixel sensor and costs $1,000 less. It retails for about $2,000. The A550 and A500 feature 14.2 and 12.3 megapixel sensors. The A550 will cost you $950, $1050 if you want a lens kit. The A500 will retail for $750 without a lens kit. All of these models lack video recording. 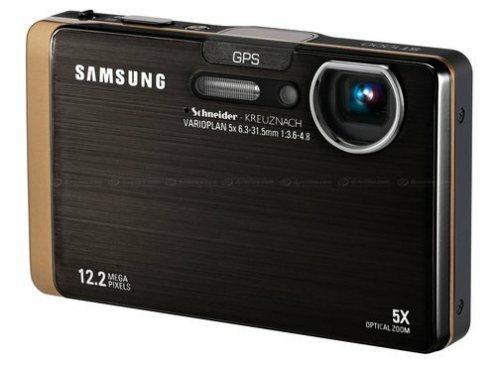 Samsung has a world’s first, with the 12.2 MP ST1000, which they are calling the “first multi-wireless compact camera”. It sports a 3.5″ touch screen LCD with 1.2 million dot resolution, WiFi, Bluetooth and GPS geotagging built-in. Some other features include a 5x zoom, HD video recording (1280x720p), ISO 4800 sensitivity and a Smart Gesture UI that allows you to access things with a tap or hand gesture. We don’t have an official price or release date just yet, but rumors suggest that it will be around $600. Taking pictures should be more like pew pew pew and less like click click click. 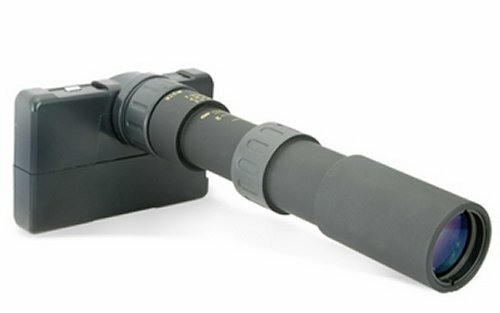 The DORYU 2-16 Pistol Camera lets you aim and shoot the way you should, as if firing a pistol. 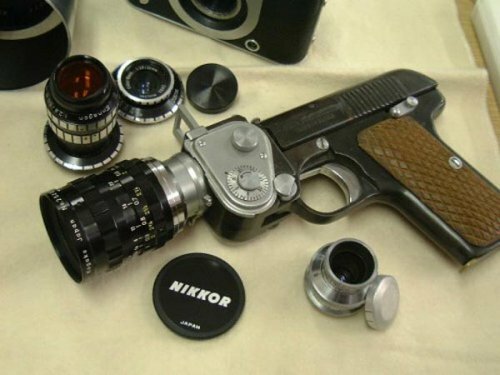 Apparently the DORYU 2-16 Pistol Camera was issued to police in Japan and it has the same C mount as a 16mm movie camera. The one in the photo features a Cine-Nikkor 25mm F1.4 lens. We don’t really know much else about it. Except that it will get you into some trouble at the airport, while traveling. The Digidudes. The name sounds like some horrible tech show on local access TV. Digidudes are something much better. Much cuter. Dare I say adorable? There, I said it. DigiDudes are little dudes that not only look all cute, they also function as tripods for your compact digital camera. Unscrew the DigiDude’s head, screw your camera onto his body and you have an instant mutant tripod. DigiDudes have three bendable legs to stay steady on any surface. 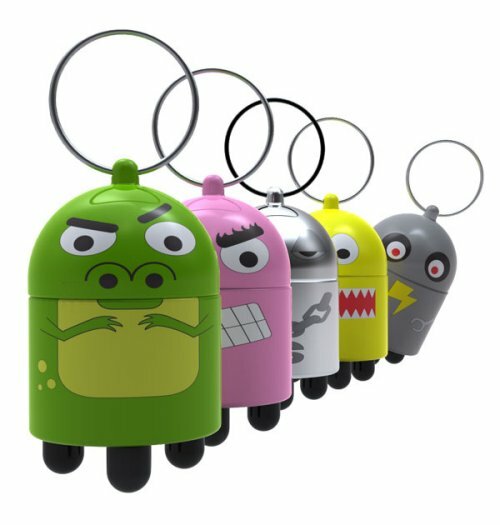 Your choice of five characters: G-bling-Money-Son, iChomp, Pinky Scorsese, Snot Buster, and BoltBot. Are all of your pictures crooked? Do you like to take photos while drunk? If you answered yes to one or both of those questions, this camera cube level will solve your problems and help you take great pics. 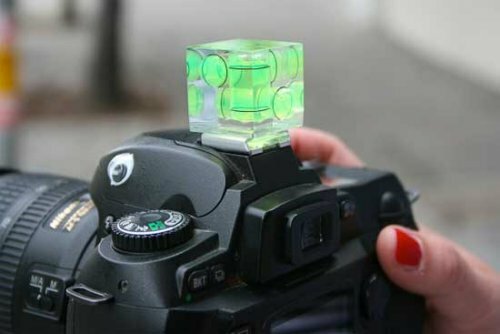 Just pop the cube on top of your camera on the flash mount and you’ll always know exactly when it’s perfectly level. This will help even the worst photographer get better. Great for when you are using a tripod too. It’s available now for $15. Snapping an even looking pic may not be rocket science, but some of us need help. So why not use a level? Apparently it’s Hello Kitty’s 35th anniversary despite the fact that every year seems like an anniversary with all of the kitty branded crap that gets regurgitated onto the market like tasty gadget hairballs. This is not the first Casio digital camera we’ve seen carrying the face of HK, but the Exilim EX- Z2 is the first 12.1-megapixel version we’ve ever seen. And what would it be if it were not covered in Swarovskis and dipped in pink? 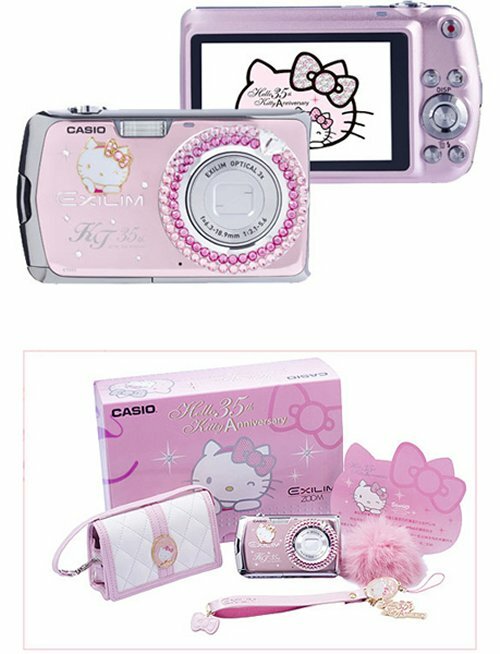 This Casio features a 2.7-inch LCD, and a 3 x optical zoom, plus it looks like the package comes with the following: a camera case, lanyard, and giant pink tribble thing. When your Digital camera runs out of juice at the worst possible moment, it’s enough to make you want to scream. The Nikon Battery Grip can help. 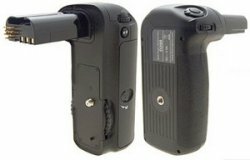 It holds six AA batteries which can be used to power your Nikon D200 through an adapter. If you are a serious camera user, this one is a no brainer. Why chance missing out on that perfect picture? The Nikon Battery Grip will retail for £99.59 and save you a ton of frustration. Today Joby announced their Gorillamobile tripod. This simple accessory attaches to nearly any mobile device, and supports it for mobile use. The tripod legs are made of dozens of ball joints that handle bending in any configuration. The Gorillamobile can function as a tripod with the legs straightened, or the legs can be wrapped around other objects for use in unusual situations. 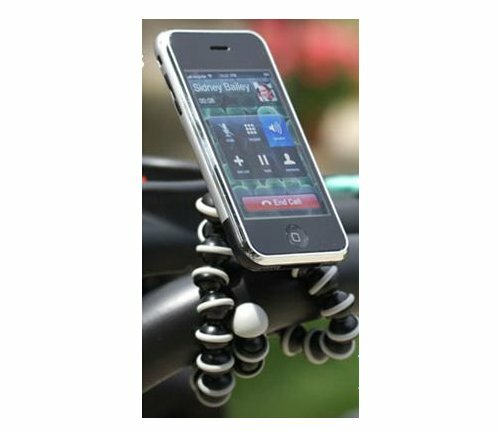 For instance you can wrap them around the handlebars of a bicycle for use while riding. What’s the big deal about this camera? It’s the only surveillance camera system in the world designed to send back captured footage over GSM cellular networks. So no matter where you are this baby will be able to send back photos to you so you can view them online. Another interesting feature is that it has no wires and is cable free. Of course they had to make it somewhat rugged too. It’s virtually weatherproof. Even the look says rugged and ready to go. Is that an Avatar Digital Binocular Sports Camera or are you just happy to see me? The Avatar Digital Binocular Sports and Spy Camera is from where else, China. It’s for the gadget lover who loves powerful magnification and is not afraid to use it in a silly over-the-top form factor. It’s got a 2 megapixel camera with a 21× optical zoom and 2.5″ display. There’s 1 GB of internal storage, a microSD slot, TV out, a voice memo and you can record stills or video. 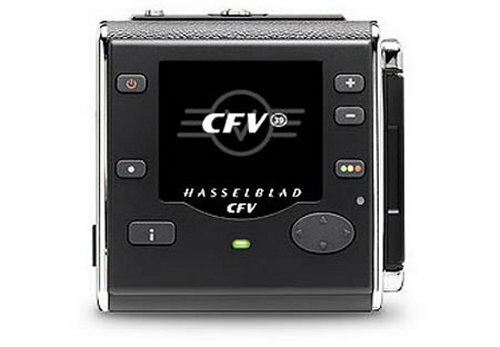 The new Hasselblad CFV-39 is custom built to match the design and functionality of Hasselblad V cameras and turns every V camera into an easy-to-use digital camera. The back is 39MP and the sensor is two times that of regular DSLRs. It features two capture modes and new digital lens connection technology for Carl Zeiss lenses that are powered by Mac and Windows-compatible Phocus image processing software. All V camera systems are wirefree, the sensor is 100 percent larger than a full-frame 35mm DSLR camera, ISO range speeds range from 50 to 800 and H camera owners can gain full access to V lens DAC connection by using the CF lens adapter. 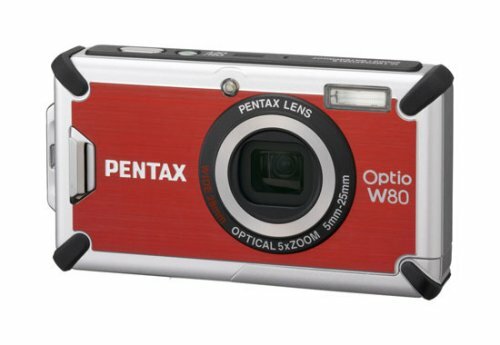 Pentax’s Optio W80 is the company’s toughest point and shoot camera yet. It’s also waterproof up to 16 feet underwater and it will survive drops from 3.3 feet and works in 14 degree weather. So if you are an adventurer looking for a rugged point and shoot, this one sounds like a good bet. It’s arriving next month for $300. The available colors are Cardinal Red, Azure Blue and Gunmetal Gray. Pentax is also offering a custom designed clear protective skin for $16.95 along with a comfortable floating wrist strap for $19.95.